Cardinal Robert Sarah, prefect of the Congregation for Divine Worship and the Sacraments, at the National Catholic Prayer Breakfast on May 17, 2017 in Washington, D.C. (CNS photo/Bob Roller). Pope Francis has publicly corrected Cardinal Robert Sarah, Prefect of the Congregation for Divine Worship and the Discipline of the Sacraments, in a letter released by the Vatican on Oct. 22, 2017. In that letter, the pope informs the cardinal that the commentary attributed to Sarah on the motu proprio “Magnum Principium,” regarding the translation of liturgical texts, is not a faithful and correct interpretation of that papal decree. The motu proprio (an edict issued by the Pope personally), released on Sept. 9, 2017, restored to bishops’ conferences the authority given to them by the Second Vatican Council to “recognize” or approve the translations of liturgical texts from the Latin Missale Romanum into the language of their respective countries. That authority was taken away by “Liturgiam Authenticam,” an instruction on the implementation of Vatican II’s constitution on the liturgy, approved by John Paul II in March 2001 and subsequently issued by the Congregation for Divine Worship. In “Magnum Principium,” Pope Francis distinguished between the “recognition” (recognitio in Latin) of a translation, authority over which is now given to the bishops’ conferences, and the “confirmation” (confirmatio in Latin) of the translation by the Vatican’s Congregation for Divine Worship. The return of authority to the bishops’ conferences was a restoration and development of what Vatican II’s constitution on the liturgy had granted them, and was widely welcomed by bishops’ conferences on all continents. Cardinal Sarah published a commentary in L’Homme Nouveau in France on Oct. 1, 2017 (the day “Magnum Principium” came into force), in which Sarah asserted that in reality nothing had changed. He claimed that “recognition” and “confirmation” are interchangeable, even synonymous terms, and that the congregation which he heads still has the decisive authority given to it by “Liturgiam Authenticam” and retains final word on the question of translations. Bishops’ conferences now have the responsibility “to translate faithfully” the liturgical texts from the Latin into the language of their respective countries. Francis revealed today that the cardinal had sent him a letter on Sept. 30, 2017, in which Sarah thanked the pope for “Magnum Principium” and provided him with his commentary, which the cardinal had already sent for publication in L’Homme Nouveau the next day. As a result of his motu proprio, Pope Francis explained, the bishops’ conferences now have the responsibility “to translate faithfully” the liturgical texts from the Latin into the language of their respective countries. He said the translation has to be faithful both to the original Latin text and to the language into which it is translated, and also must be comprehensible to those for whom it is destined. The motu proprio also grants bishops’ conferences “the right to judge the authenticity and consistency” of the translations, and verify if the translation is faithful to the original Latin text. They can do so in dialogue with the Holy See, if necessary. This recognition was previously a task of the congregation. The pope explained that “recognition” means “the verification and preservation of conformity to the law and to the communion of the church” of the translation. He insisted that "the process of translating relevant liturgical texts (that is, sacramental formulas, the Creed, Our Father) into a language—from which they are considered authentic translations—should not lead to the 'imposition' on the bishops’ conference of a given translation made by the dicastery (congregation), as this would undermine the right of the Bishops." Pope Francis then clarified what “confirmation” means. He said "it is not a purely formal act but necessary for the edition of the liturgical book translated. It is granted after the version has been submitted to the Apostolic See for the ratification of the Bishops' approval in a spirit of dialogue and help to reflect if and when necessary, respecting their rights and duties, considering the legality of the process being followed and its ways. " Importantly, Francis clarified that “confirmation” does not necessarily mean a detailed word-by-word examination, except in the obvious cases that can be brought to the bishops for their further reflection, noting that this “is particularly valid for the relevant formulas, for example with the Eucharistic Prayers and especially the sacramental formulas approved by the Holy Father." Cardinal Sarah, who was appointed prefect of the Congregation for Divine Worship and the Discipline of the Sacraments by Pope Francis on Nov. 23, 2014, originally released his commentary in French, but it was rapidly made available in English and other languages on websites and blogs known to be sympathetic to his way of viewing the liturgy. Significantly, Pope Francis asked him explicitly in his letter "to provide for the dissemination of my reply to the same sites” on which Sarah’s commentary was originally published. He also asked Sarah to send his letter “to all Episcopal Conferences” and to “the members and consultors” of the congregation that he heads. Pope Francis asked Sarah explicitly in his letter "to provide for the dissemination of my reply to the same sites” on which Sarah’s commentary was originally published. The Vatican had intended to publish the pope’s letter tomorrow, but it had to move up its release after an Italian website close to Sarah’s liturgical position published the entire text this morning. Many in Rome are asking the question: who gave the letter to the website? This is the third time that Pope Francis has publicly corrected Cardinal Sarah for giving an alternative interpretation to his instructions on the liturgy. On previous occasions, the pope corrected the cardinal after Sarah misrepresented the pope’s instruction on the washing of the feet on Holy Thursday, and again after Sarah publicly advocated that the Eucharist should be celebrated with the priest facing east (“ad orientem”). 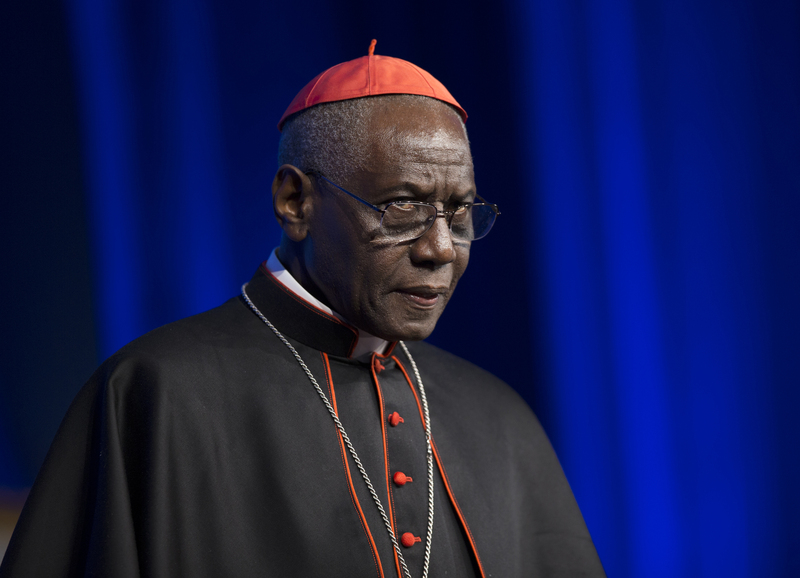 Cardinal Sarah’s divergence from the pope has become a cause of embarrassment, several Vatican officials told America. They said they find it difficult to reconcile his public statements with his role as head of a congregation that is meant to be at the service of the papacy. A previous version of this article mistakenly stated that "Magnum Principium" was released on September 15, 2017. It was released on September 9, 2017. Ironically, I think we should be able to see a faithful translation of His Holiness' actual words to Cardinal Sarah. Please consider looking to other sources and even doing a Google translate before forming opinions that insinuate division within the hierarchy of our Church. I understand and appreciate the concern of America Magazine, but I think we all - on both sides of various church issues - have allowed ourselves to get "hyped-up" on sensationalism that conjectures all sorts of things beyond the facts. Let's remember the common goal of Christian unity and the mission of Christ's body on earth. "Finally, Your Eminence, I reaffirm my fraternal gratitude for your diligence and, recognizing that the “Commentaire” note was published on some websites, and was wrongly attributed to your person, I ask you kindly to see to the distribution of this my response to the same sites, as well to the the forwarding of the same to all episcopal conferences, and to the members and the consultors of the Dicastery [the CDW]." The phrase "wrongly attributed to your person" is an important detail left out of this article (presumably unknowingly or unintentionally). Also, considering the request to "see to the distribution of this my response..." --which was cited above in this article-- why imply that something mischievous had been done when the letter was released a day earlier than someone at the Vatican had planned? I ask you to give some benefit of the doubt here. Cardinal Sarah wasn't instructed to "see to the distribution of this my response after 'the Vatican press office' has published it on my behalf or has given you the approval to proceed. Thank you for the opportunity to comment. I believe such dialog is exactly what's going on in the higher levels of the Church and is welcomed by our Holy Father. I don't like the word "rebuke". Remember how when the very Cardinal Sarah wrote to the Wall Street Journal about the pastoral care of homosexual persons, the conservative Catholic Media put the headlines "Cardinal Sarah blasts Father James Martin," whereas in fact the criticism of Father Martin was, in fact, mild and secondary (whether one is in agreement with it or not). One should avoid needless polarization. I do think that Pope Francis corrects something that Cardinal Sarah said; and I think he was right to do so. "Rebuke" sounds like Francis is denouncing some misdeed. This just fees the fires of the critics of Pope Francis who like to portray him as the brutal authoritarian, whereas he is in matter of fact acting in favor of decentralization. Has anyone heard of "killing with faint praise"? This is what the Holy Father is doing. A man of Sarah's stature should know better than to contradict what the Holy Father has said and act like he knows better. And what will America Magazine say when Cardinal Sarah becomes Pope ? Gerard O'Connell is America’s Vatican correspondent.